In July 2014 the eyes of the world will be on Scotland. The Glasgow 2014 Commonwealth Games will be the biggest sporting and cultural event this country has ever seen. And at the heart of every successful Games are the volunteers. They’re the people who give up their valuable time to make sure everything runs smoothly and without them the Games just wouldn’t be the same. Everyone has skills to offer that can be used to deliver this amazing event for the city. And skills developed in 2014 will lead to great things beyond for the city and those involved. Glasgow is known as The Friendly City so what better way to prove it than to have as many Glaswegians as possible be the welcoming face of the Games? And, hopefully, that’s where you come in. 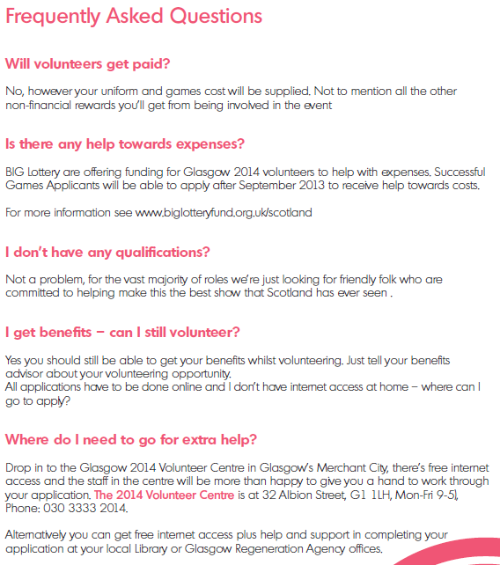 Glasgow 2014 is looking for friendly people to become volunteers. This is your chance to be a key part in the experience, right here in Scotland. 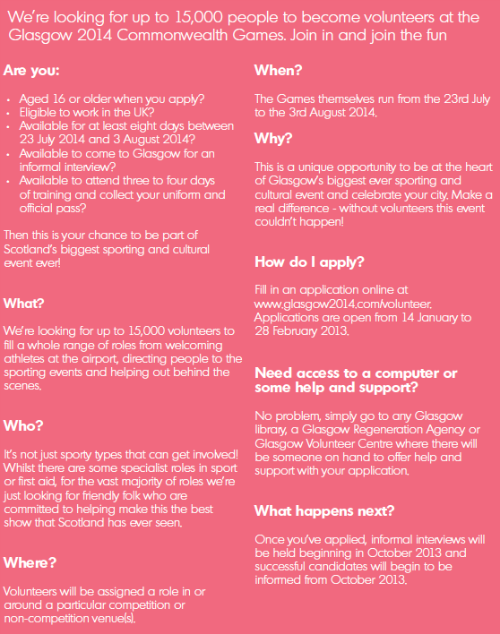 The Glasgow 2014 Volunteering campaign was launched on 14th January and runs until 28th February. The search is on for 15,000 volunteers to fill a whole range of roles from welcoming athletes at the airport, to directing people to their seats, to helping out behind the scenes. Who knows, you might be the lucky person who shows Sir Chris Hoy into his very own Velodrome. Not all of the roles will be high profile or in the front line. And many might be away from the athletes. They are all, however, crucial to making sure the Games run smoothly. So if you’re a friendly person who’s committed to helping make this the best show that Scotland has ever seen, this could be the chance for you to play your part. To help you get involved the organisers have put in place support and information to help and encourage you to make the most of this opportunity to represent your City. These are drop in events but to get maximum benefit you should aim to be there at 1.30 when various speakers will make presentations and outline key information. Staff will be available to help you begin or complete your application. 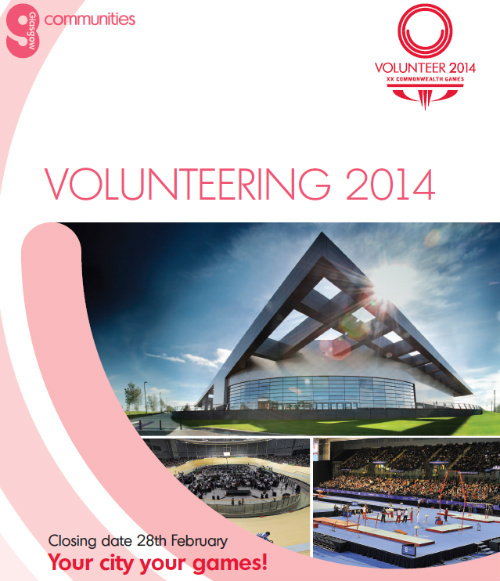 Other non 2014 Games volunteering opportunities across the City will also be available on the day. 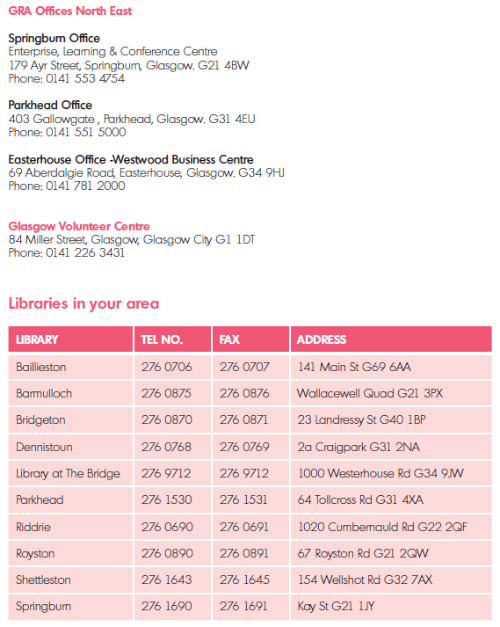 If you’re keen to be involved, but are unable to get to one of the above events and need access to a computer or need some help and support in your own time then simply go to any Glasgow library or the 2014 Volunteer Centre at 38 Albion Street in the Merchant City where there will be someone on hand to offer help and support with your application. You are encouraged to help in spreading the information about Glasgow 2014 volunteering by word of mouth, in newsletters, and on websites you post on. A volunteering leaflet is shown throughout this post, providing answers to many of the most common questions as well as providing information on where support and access to laptops is available to assist those wishing to become a volunteer. Downloadable PDF version available here. 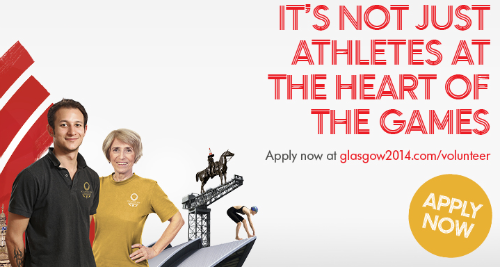 To register your interest online, visit volunteering.glasgow2014.com. Remember – the closing date for completed applications is the 28th February.